Watch out for that cake! You don’t have to cross the Atlantic to see fabulous French farce at its finest. 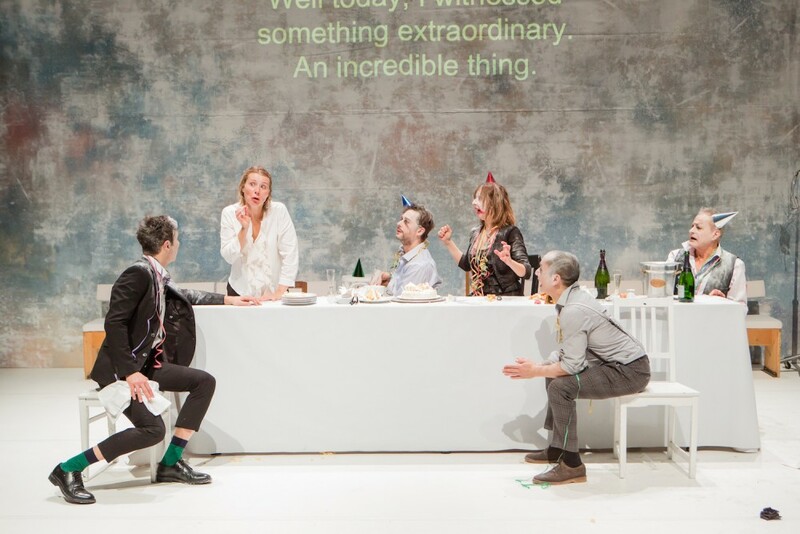 Just over the Brooklyn Bridge at BAM, a terrific troupe of actors from Paris’s Théâtre de la Ville is making mayhem with a mash-up of Ionesco farces that’s as fantastically funny as you’ll ever see. Director Emmanuel Demarcy-Mota and his seven merry mockers have dug into five farces by the famous Romanian born French author (The Bald Soprano, The Lesson, Frenzy for Two, or More, Jack, or The Submission, and French Conversation and Diction Exercises for American Students.) From these absurdist romps, they’ve excised a series of scenes woven together into a wild ninety-minute ride. The result? “Ionesco Plus Improv Equals Insanity!” Staged around a long white table, the scenes feature family gatherings, weddings, and birthdays. Actors play multiple roles, switching partners and genders, exchanging sequined berets for party hats and trousers for dresses. They play family games, love games and nonsensical word games. They marry, fight, and reconcile. Mother berates son, sister berates brother, husband berates wife, and so on. All these antics are performed in an exaggerated acting style, combining classical commedia dell’arte, mime and slapstick technique with the madcap energy of the Monte Pythons, Flying Karamazov Brothers, and SNL. One of my favorite scenes is the door-bell-ringing sequence from The Bald Soprano, when the cast debates whether – if the bell rings – there is someone there or not. It turns out to be a fireman, who blows out the cake candles with a fire extinguisher. 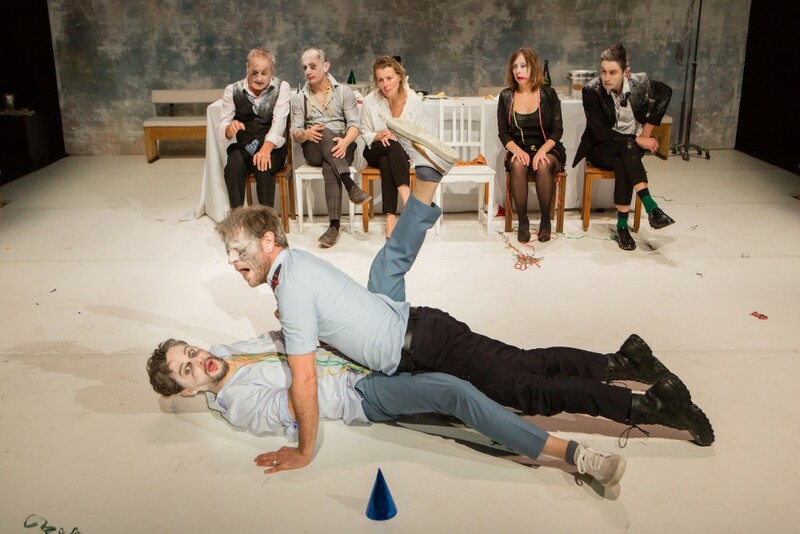 “You can’t have an answer without a question,” says one actor in the finale, as the company recites a cascade of Ionescan absurdist phrases from The Bald Soprano that make complete sense… until they don’t (“ca ca ca ca” etc.) This is classical theatre of the absurd at its finest. 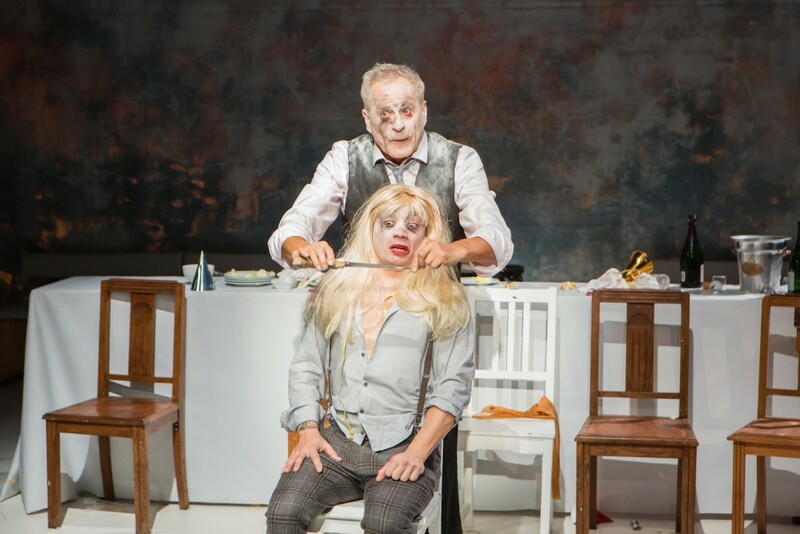 Ionesco Suite, Théâtre de la Ville, based on texts by Eugène Ionesco, directed by Emmanuel Demarcy-Mota, at BAM Fisher until January 26.